Up till Google Now was available only on mobile or tablet devices. But from yesterday, Google Cards are available even an PC or Mac if you are using Chrome. "If you use Google Now on your mobile device, you can see certain Now cards on your desktop computer if you're signed into Chrome, including weather, sports scores, commute traffic, and event reminders cards," explained Google. 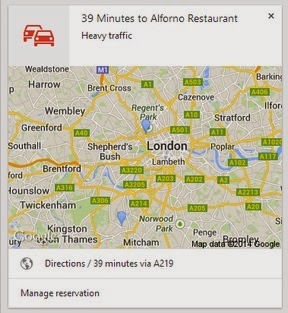 Google Now uses location information on a smartphone to serve relevant information. For PC and Mac users, the location information will be determined through a user's smartphone. The idea here is that if you are using a computer in your office, it is likely that you will have the smartphone with you and hence it will be useful to you if you get a Google Now card on the Chrome browser at 5.30pm, telling you the best way back to home so that you don't run into a traffic jam. Google says that on PC and Mac even if Chrome browser is turned on, it will periodically check for the location of your smartphone "in order to continue showing you relevant Now cards". But it adds that if you want to turn it off, you can do it from the Chrome's notification centre, which can be accessed by clicking a bell-shaped button on the bottom right corner of the browser window. I have always been a big fan of Google Cards and the way they Sync between location, time and activity pattern is cool.